Transform your backyard or garden area with our LuxCraft Rose Double Lawn Glider with Roof. Family and friends will never want to leave this comfortable seating area. This spectacular seating area will provide the centerpiece for your outdoor display. All of our Amish outdoor furniture is built with durability, longevity and your comfort in mind. An Amish glider like this LuxCraft Rose Double Lawn Glider is sure to be the spot family and friends will flock to. There's nothing like enjoying the beauty of the outdoors with loved ones while you're surrounded by comfort! 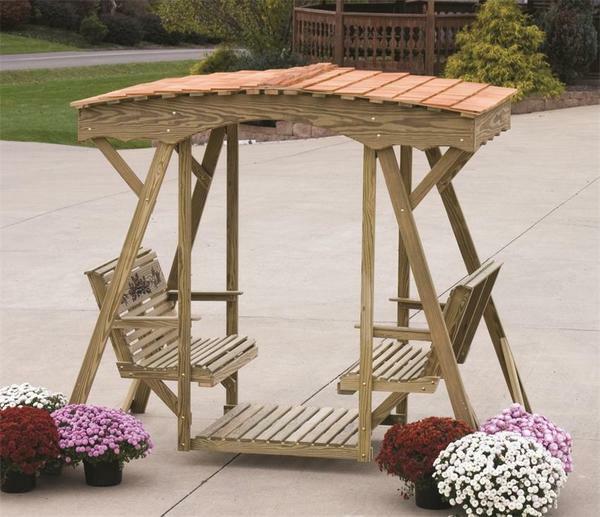 The roof of this Amish glider comes assembled as well as each side. The swing and floor come assembled. There are instructions included on how to put these pieces together to fully assemble your double lawn glider. Consider our line of Amish Outdoor Benches to complete your outdoor scene. Call one of our Amish Furniture Specialists today at 1-866-272-6773 with any questions and be sure to visit our blog for information on outdoor seating options. This Item Is Unfinished Pressure Treated Wood. It Is Not Painted.